Information about recent changes in the Merchant Center. To stay informed about the latest releases subscribe to the RSS feed or sign up for the product newsletter. It is now possible to reset your password without being redirected to Admin Center. You can click “Forgot password” link on newly redesigned Login page or just go directly to https://mc.commercetools.com/login/forgot. The Cart Discount Rule Builder helps you create discounts quickly and easily, without having to understand the complex predicate language underneath. Explore it today in the Merchant Center under Discounts > Cart Discounts and read the Docs for more information! We’ve enhanced the Merchant Center’s Product Discount and Cart Discount list by now allowing to sort by discount name and type (relative/absolute). The Merchant Center now has a welcome page. This page will greet you upon loggging into the Merchant Center and will be the default page when clicking on the Merchant Center logo in the upper left corner. The page provides you with an overview of the different parts of the Merchant Center as well as links to documentation and release notes. The Dashboard, which was the default view upon login prior to this update, is still available in the left-hand menu. When editing a variant’s tier price, the Merchant Center now supports the management of high precision prices in the “Manage the price” view in the Products section. When editing a variant’s price, the Merchant Center now supports the management of high precision prices in the “Manage the price” view in the Products section. The “Add Order” flow and the “Orders list” in the Orders section now also support viewing high precision prices and adding custom line items with high precision prices. The support of tier prices will be added soon. Quick Access helps you to look and navigate to almost any part of the Merchant Center with just a few keystrokes. Anywhere in the Merchant Center, press the F key. Type a search term in the text field, for example “Products”. Select the option you want from the autocomplete drop-down and press Enter. Below is a screenshot illustrating the new Quick Access feature. When selected, both new filters present you with a list of custom fields from your data model to use as parameters. These filters can be used in place of the Order Predicate and Payment Predicate filter options, reducing predicate syntax issues. Select Order Custom Field or Payment Custom Field from the Add Filters drop-down. Below are are two screenshots illustrating the new Custom Field filter options. We are proud to announce that the Merchant Center is now available in Spanish. As our customer base grows, so does the need for translations to our diverse users. This release allows individual users to choose from three available languages: English, German and Spanish. In the top right corner go to My Profile. Under Personal Settings select your language. Note: All Merchant Center features are released in English and German first. Other supported languages are released within 4 weeks. For projects with a sizeable amount of Orders, setting the quick filter to e.g. “Last 30 days” is advised to ensure quick results when doing Order searches. A View is helpful when you have tasks that require different perspectives on customers and their various properties. Once a View is created, you can easily switch back and forth between any saved Views and the Customer List will adapt accordingly. It is now possible to set a Custom Type on Orders and Customers. Setting a Custom Type will enable a set of input fields that have been defined as your business-specific data points for Orders and Customers respectively. Under Project Settings, you can now manage the Channels for your project. A role captures the purpose and control of a channel. If e.g. you aim to track inventory by Channel, you will need to create a Channel with the role of Inventory Supply. If the purpose is to configure prices scoped by Channel, you will need to set the role of Product Distribution. Please notice that a channel can have multiple roles. If e.g. 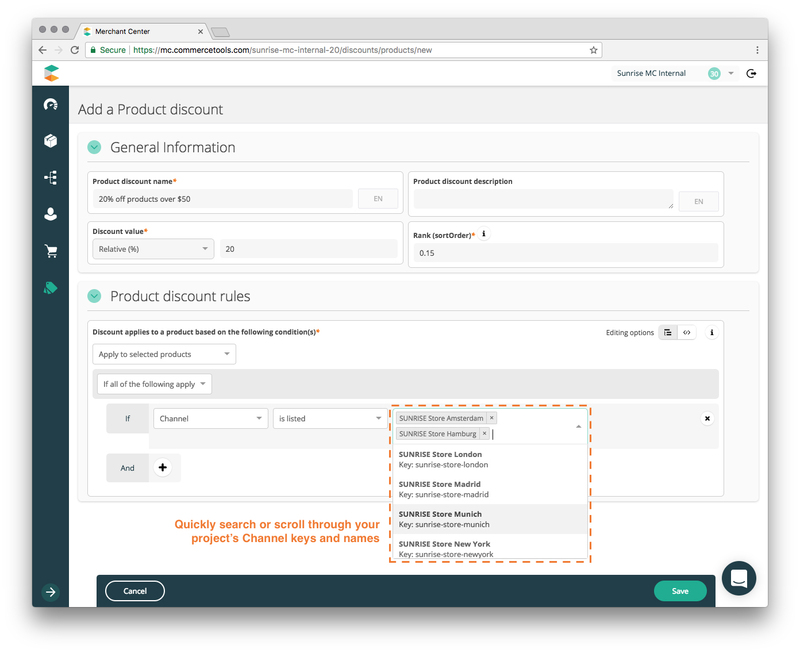 a Channel has specific pricing as well as inventory to track, you will set both Inventory Supply and Product Distribution as roles for that one Channel. For a list of all possible roles, see Channels API documentation. When creating a Channel, you can in addition to the general information (key, name, roles, description) optionally set an address for the channel. It is also possible to set a custom type. Setting a custom type will enable a set of input fields that have been defined as your business-specific Channel data points. Once a Channel has been created, you can view the configuration by going to the details of a listed Channel. From the Channel details page, it is furthemore possible to delete a Channel. When searching for and selecting an item for an order in the Add Order flow, it is detected if country specific pricing exists for the given variant. If it does, you will be prompted to select which country the order should use for pricing. The country selection will act as basis for any further item that is added to the order. Should you wish to update the country, you can do so under the Order Summary. When the country is updated, all already added items of the order will have their prices updated accordingly. 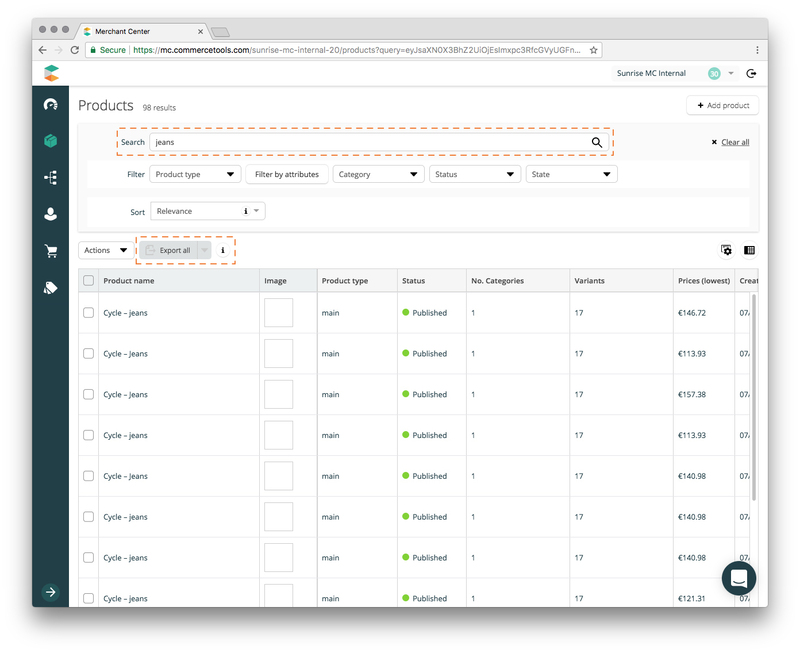 With this release, it is possible now to manage Product Types in the Merchant Center. Under Settings section, you will find a link called Product Types. Here you can get an overview of all exisiting Product Types within your project as well as a possibility to update or delete them from here or to create a new one. To delete a Product type you have to open the one you want to delete from the list of existing Product Types and click on a “Trash bin” icon. After confirming this action selected Product Type will be deleted. In addition, when doing search by name or city, the search is no longer case-sensitive. 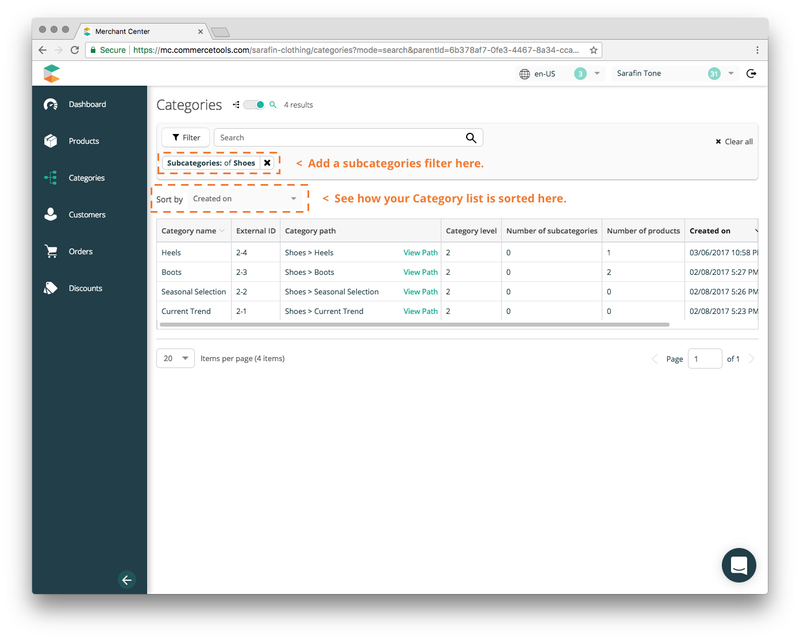 With this release, it is possible to prefill the Add Order flow with the content of an existing order. You do so by copying the existing order. You can find the copy button in the Order List as well as when viewing a specific order. Please note that properties such as Payment references, Deliveries or Returns are not copied over into the new order creation. Furthermore, when an order is copied, the product data of the copied-over line items will be pulled again and should e.g. a new price exist or a tax category have changed, then the new order will be calculated with these new values. The ability to copy an order can be a nice shortcut when a merchant per business protocol does not operate with partial sale cancellations. In such cases, the original order is cancelled in its entirety and a new order has to capture e.g. the removal of line items. Instead of creating the new order from scratch, the ability to copy the original order into the Add Order flow eases the process. The Add Order flow will be pre-filled with the data of the original order and can quickly be adapted to reflect the wanted changes. Under Developer Settings, it is now possible to view existing API Clients for a project and to create new API Clients. When going to the details of a listed API Client, you can see the permissions scopes that it is configured with. Should you wish to use an existing API Client as a blueprint for a new API Client creation, it is possible to copy an API Client. Please be aware that to ensure the security of your project, the credentials are accessible only at the time you create it. They cannot be viewed later under API Client details. Please make sure to save the credentials in a secure location. All time stamps in the Merchant Center will now be displayed in the time zone of your choice. You select the time zone under My Profile. If e.g. a product was created 09/29/2017 3:30 PM in Europe/Berlin CEST (which is + 2 hours from Greenwich time), and you change the time zone to Pacific/Midway SST (which is -11 hours from Greenwich time), the time stamp of the production creation will display as 09/29/2017 2:30 AM. For projects with product prices in multiple currencies, the Create Order flow will now prompt the user to select the currency of the specific order. Bugfix - It is now possible to change validFrom and validUntil dates on Discount Codes and save the changes successfully. The new column ‘Times Applied’ in the list of Discount Codes informs you about the number of times a discount codes was applied (to orders). When editing a variant’s price, the Merchant Center now supports management of price tiers. 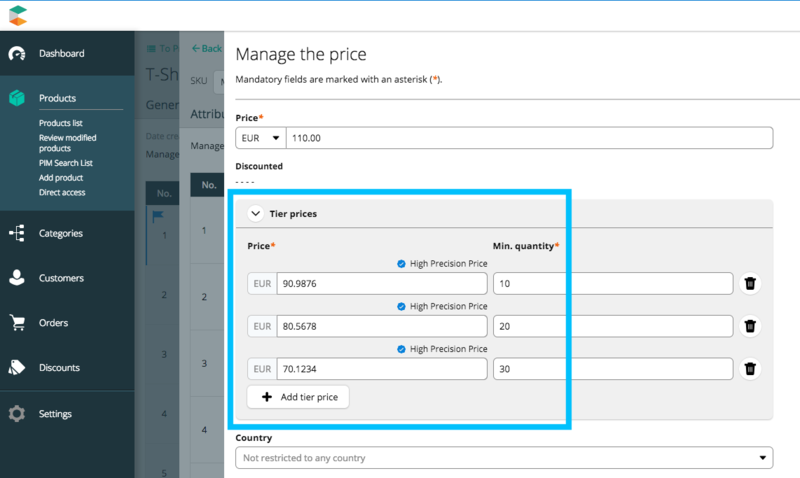 A price tier is selected instead of the default price when a certain quantity of the ProductVariant is added to a cart and ordered. For example: the price can be lower if more than 10 items are ordered. Price tiers are also shown in the variant’s price list view. Discount Codes can conveniently be added directly from the Cart Discount Detail page. In order to do so, the Cart Discount must be saved first. Previously, a Cart Discount had to be created first, and a Discount Code needed to be added separately. We’ve enhanced the Merchant Center’s Discount Code list by now allowing to sort by valid from or until date. We fixed a smaller issue so that now navigating from one page to another is easier when simply entering the page number you would like to access. Just press enter or use the top/down number selector. The bugfix resolves an issue where the validFrom/validUntil date could not be saved in the Merchant Center. Creation of returns for ordered items is now possible in the Merchant Center. You can select items and group them in a return that has a tracking ID and a return date. The shipment status of the return is initially either Advised or Returned. Once created, each return item can have its shipment- and payment status tracked individually. Should you operate with line item states where certain states signify a return, you can add the state role of Return to them. By doing so, items with these states will conveniently be pre-seleceted when the Return is initiated. As part of decomissining the Admin Center, the Project Settings are now available in the Merchant Center. With this release, we are covering International project settings (i.e. countries, currencies, languages and zones) and Tax settings. In the near future, we will add Shipping settings as well. 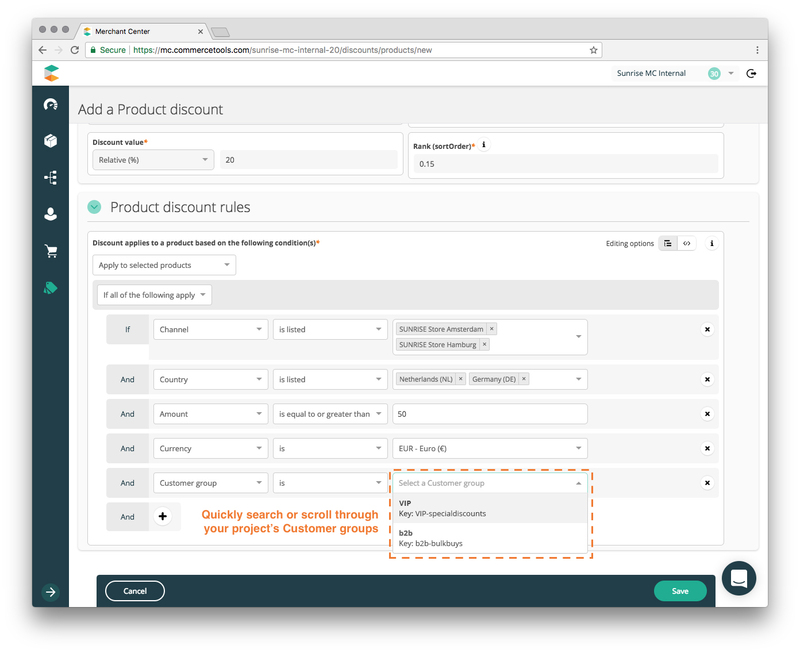 Discount Codes can now be managed more efficiently by assigning a discount code group (string) to them. Additionally, groups are supported in the Discount Code list. In the Discount Codes list, multiple selected Codes can now be bulk deleted or activated/deactivated at once. The new view in the Products section allows you to review pending changes on products. 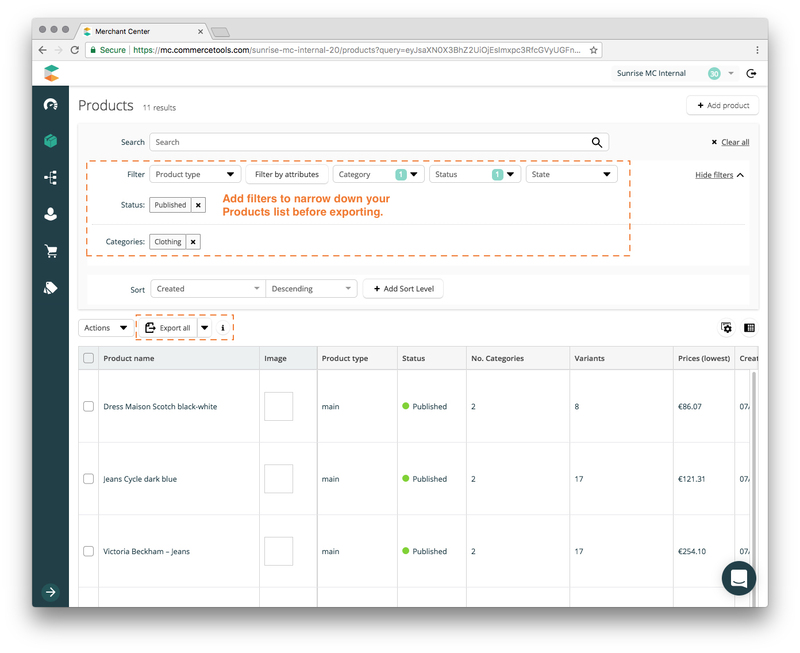 You can edit or revert individual changes and publish or discard product updates either per product or through bulk actions. Check out the documentation for more details. We have added support to search Discount Codes by name, code or to filter by activation status. We also improved the channel and customer group selection when creating or updating variant prices. Custom Fields on Cart Discounts and Discount Codes can be viewed and edited in the Merchant Center. They are situated in an extra tab in the respective section of MC. For now, new custom fields cannot be added yet. So far, it has only been possible to view already created Orders in our Merchant Center. With this release, it is possible to create an order from scratch in the Merchant Center. “Free Gift” Discounts can now be created in Merchant Center. When adding a gift line item as a Cart Discount, the price of this item will be 0, and the item will automatically be added to the Cart once the Cart Discount matches the Cart. 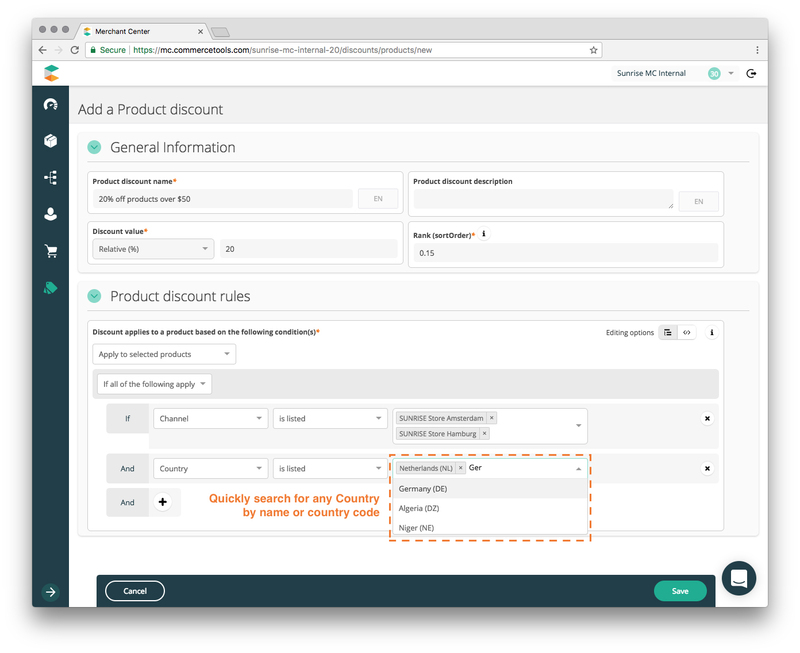 You can duplicate Product and Cart Discounts directly without having to manually recreate all settings. You can control the “validFrom” and “validTo” settings of both Cart Discounts and Discount Codes now. This helps you to manage and plan promotional campaigns in advance. If you want to stop any further discounts from being added to your customer’s cart after a certain discount was applied, you can use the stacking mode to define this. When adding or editing a Cart Discount, just activate the checkbox “Do not apply any further discounts after this one”; and any matching Cart Discounts with a lower sortOrder will not be applied after this discount. In addition, we added the ability to control the Cart Discounts stacking mode via the MC so you can e.g. make certain promotions exclusive to others. It is now possible to customize the columns of the Order List. The Column Manager shows all possible columns and allows you to configure the Order List so it contains the columns that are useful for you. 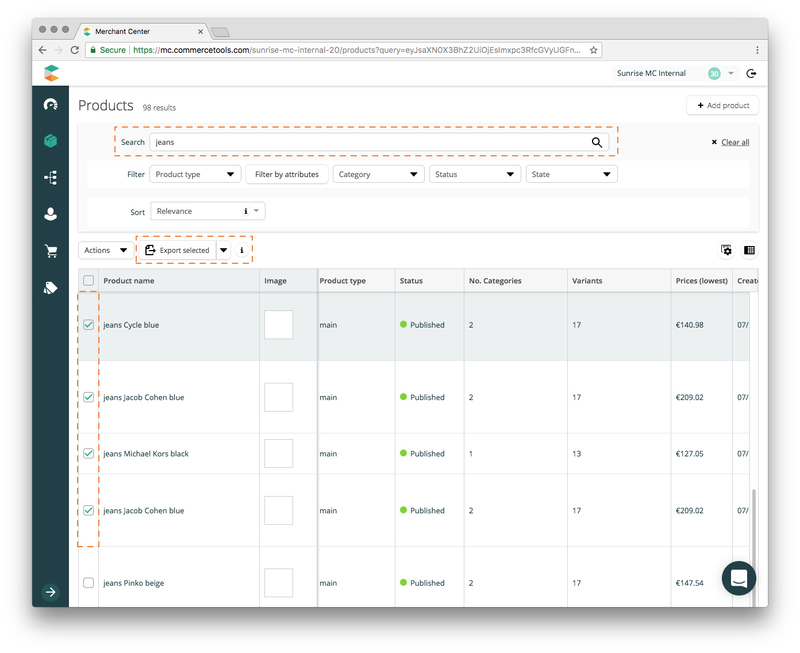 When Customers, Orders and Line Items have Custom Types set, it is now possible to view, edit and delete the Custom Fields. In order to create a more seamless experience between our Merchant Center and our IMPEX tool, we have added a new Export feature to our Products list in the Merchant Center. This Export feature allows you to easily export all your products, filtered products or only selected products from the Merchant Center Products list. By selecting the “Export all’ or “Export selected’ actions, we will redirect you to a pre-filled export form in our IMPEX tooling. From there, all you will need to do is select the “Run command” and we will process your request and have your files ready for download. More information about the Product export can be found by selecting the Information icon next to the Export action. 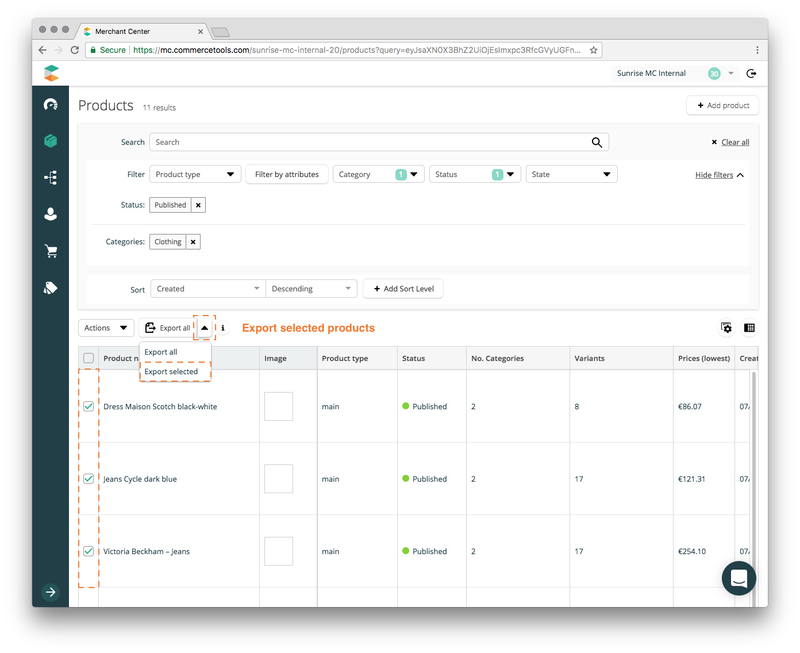 “Export all” allows you to export all products in the Products list, whether it’s all Products in your Project or a filtered list of products. To export only a few selected products from the Products list, you can easily select the relevant products needed and use the dropdown action button next to our “Export all” action. By choosing “Export selected” you can export your selected products from our IMPEX tooling. Currently, we are unable to Export a Products list with a Search term applied. In this case, we recommend selecting the Products to export all selected Products. 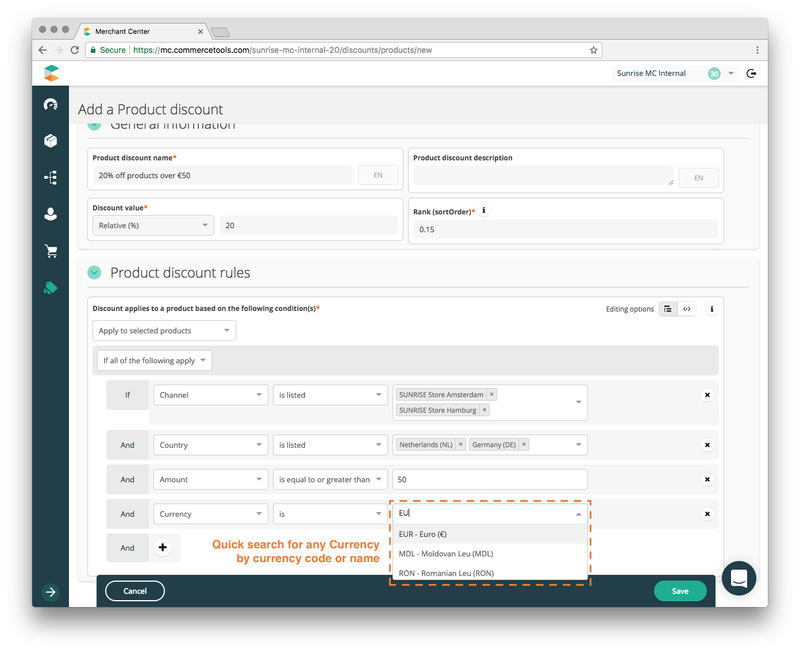 Now you can easily apply Channel, Country, Currency and Customer group rules to restrict your discount to only apply to specific Product prices in addition to any other condition or rule. For example, you would like to create a 20% discount for all Shirts that cost over 50 euros for your VIP members. You would like this discount to only apply to your store in Amsterdam, The Netherlands and Hamburg, Germany. You can add a Channel rule for your Amsterdam and Hamburg store by searching for Amsterdam and Hamburg in your Channel input field. And then search for the two associated countries: The Netherlands and Germany. To make sure that this discount only applies to Shirts with a price over 50 euros, you can add the rule for an amount of 50 and with euros as the currency. Finally, to make sure that this does discount only applies to prices meant for your VIP members, you can easily select the VIP customer group. From the Cart discount list, you can see an overview of all the Cart discounts for your project. The Cart discounts are sorted based on the Rank (aka sortOrder) set in each Cart discount. This is particularly helpful in case you have a cart with multiple discounts applied. Carts with multiple discounts applied will be applied in order from the top of the list to the bottom. Currently, all matching discounts will be applied to the cart. For example, the ‘Fall Sale’ discount is in the 2nd place, while the ‘Black Friday!’ discount is in the 5th place. However, the ‘Black Friday!’ discount requires the user to enter a discount code. If the customer’s cart qualifies for the ‘Fall Sale’ discount and also applies the discount code for the ‘Black Friday!’ discount, then then the ‘Fall Sale’ discount would apply to the Cart first, and the ‘Black Friday!’ discount will be applied second. Editing Cart discounts allows you to have full control over the conditions a Cart must fulfill in order to qualify for a discount. You can customize the conditions in the Cart discount rules panel. For example, you can set the discount to only apply to Carts with a total over $100. Furthermore, our Cart discount target allows you to choose if you want to target the Cart’s shipping costs or a specific product in your customer’s Cart. When you’re ready bring your discount live, you can easily activate or deactivate your discounts or even require your users to enter a special discount code to enable the discount. Our flexible Cart discount rules and targets allow you to customize Cart discounts for your customers. You have great flexibility with building discounts for your customers. 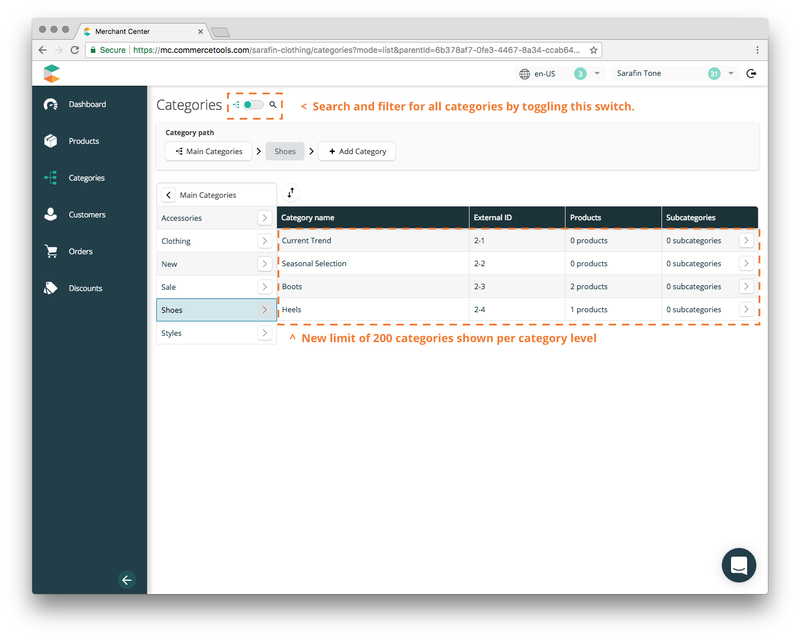 In our Category list, we increased the number of categories we can load to 200 categories per level. We have done so to provide you with a high performing Category list. If you have over 200 categories per level, please use our Search feature which is accessible with the toggle switch at the top of the page. You can apply a ‘Subcategory’ filter to see the full like of all categories under a specific Category. In our Category search list, we also added the feature of sorting by relevance. When you enter a search term, the list of results returned will now be sorted based on the Relevance to the search term. You can now also see the ‘Sort by’ above the table header in our Category search list - select the information icon when sorting by Relevance to learn more. 6 September 2017 - Cart Discounts is live!